Well, if you remove the Plaid, this challenge is right up my alley. I practically live and breathe Lawn Fawn’s fairies and I can’t seem to stay away from their Dad and Me set either! However, plaid is not really my thing… I had to really dig to find plaid paper. I thought for sure one of those pads of patterned paper I’m always buying and never use had to have some plaid. I found some in the very last pad I looked at. It’s a weird pad full of paper for all the different holidays. I liked it because a lot of the pages have glitter on them :). And of course, my plaid paper has glitter. It’s like it was meant to be. I used my favorite Stitched rectangle die (Simon Says Stamps) to cut down my plaid paper. Then I used MFT Stitched Rectangle Scallop frame to cut out a white frame as well as a vellum panel to fit inside the frame. I had some flowers from Lawn Fawn’s Fab Flowers that I had stamped and die cut a few weeks ago (I spent a whole weekend stamping and die cutting images). 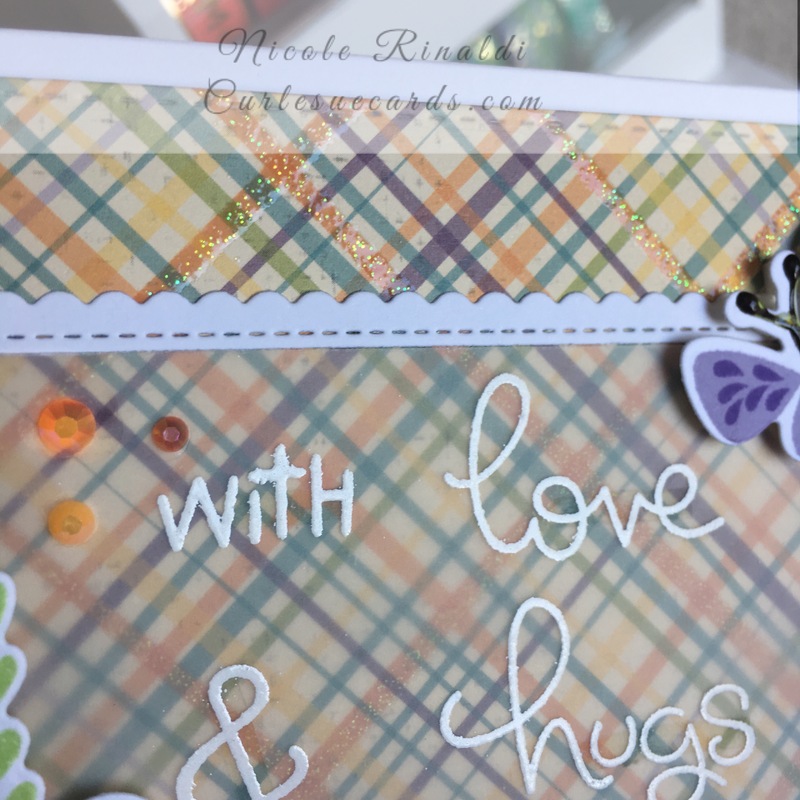 It just so happened that a weird color combo I used for the stamp layering fit perfectly with the colors on the plaid paper. The combo was so funny looking when I first made it I almost threw it away. I’m glad I kept it. Since I was using Fab Flowers I decided to use the sentiment from that set. I stamped it in Versamark and heat embossed it in white on the vellum. I put some double sided adhesive behind the letters and stuck it down. I used foam tape to adhere the flowers and the butterfly. 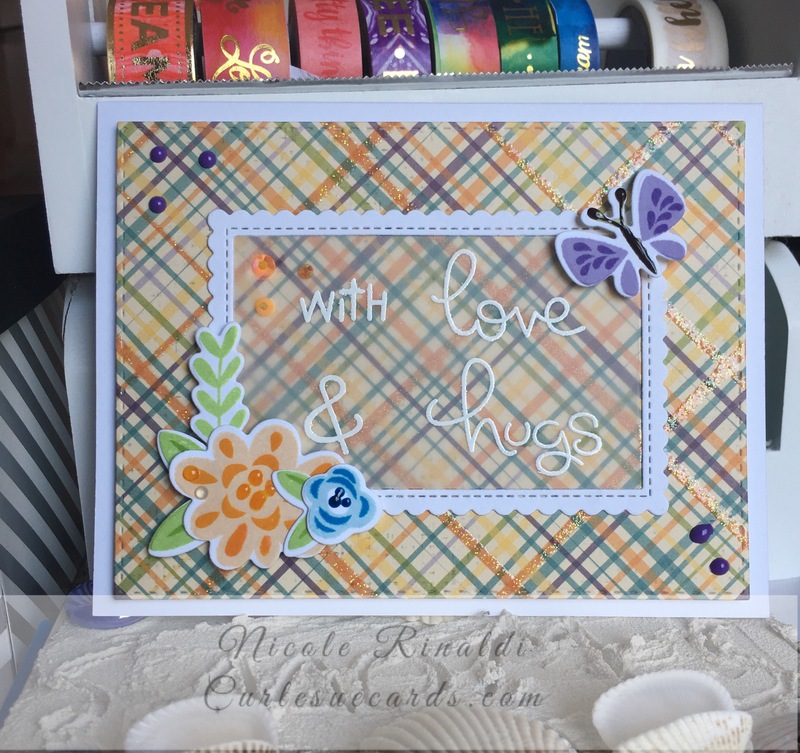 I accented the card with some Lucy’s Cards orange jewels from the Rainbow pack, and different color Nuvo Drops. This card came together pretty quickly once I found the paper. I meant to just hunt up some plaid paper and make the card another night, but next thing I knew the card was done. Having the images made ahead of time helped a lot. Even though the colors are not something I would normally do, the paper pulled it together. I need to step out of my comfort zone more often! Thanks for stopping by! I hope you enjoyed the card! I had fun with this one, and liked how the plaid went with the flowers. I’ll have to keep plaid in mind in the future! Gorgeous card! I love the use of vellum! Thanks for sharing with us at Lawn Fawnatics! Beautiful card! Love the design of this and the pretty flowers with the plaid!